The Lower end of today's Fishpool Street was known as Salipath, although how far it stretched is uncertain. This uncertainty is not new for in 1596 a building was described as located in "Sallypath alias St. Michells Streete alias Fishepoolstrete". It was recorded as "Salipath or street of Kingsbury" in 1290. The lower part of the street, at least as far as St. Michael's Manor began life as a Roman road. How far this ran up the hill is unknown but it was probably the terracing of this which resulted in the high pavement on the uphill side of the street. On the northern side of the street properties stretched back to the town boundary here marked by Downfield Hedge which ran along the line of the Modern Mount Pleasant and demarcated the Abbots field called Down Field. One such property was a cottage known as Coppydhall which at one time belonged to William Grindcobbe one of the local leaders in the Peasants Revolt in 1381. It was described as "ruinous and in decay" in 1538. By the south west corner of Down field was a sheepfold recorded in the perambulation of the town boundary in 1327. As late as the 19th century a pound was situated here. On the southern side of the street, properties stretched back to the river. Among those who held land here were the Nunnery of St. Mary de Prae, including a meadow of 55 perches, sometime held by Andrew the Tanner. This was effected by works carried out on the river to improve the flow to the Abbey Mill in 1334. In 1538 the Abbot leased a tenement here to Henry Gape, situated between land of John Baker on the east and the Priory of St. Bartholomew in West Smithfield (i.e. Barts Hospital) on the west. All this was just to the east of the present St. Michael's Manor. The Hospital Lands as they were later known were eventually incorporated into the grounds of St. Michael's Manor. This was originally built as a 15th/16th century 'Wealden" house but has been much altered over the years. Immediately outside the town boundary was the Abbots Grange of Kingsbury and the house now known as Kingsbury Manor is partly of late medieval date. Like the Grange of St. Peter this was threatened with destruction in 1381 and later strengthened by Abbot John Moot (1396-1401) and provided with an earthwork defense. Moot also built a barn to store the estates produce and this still survives although one of its aisles has been demolished. 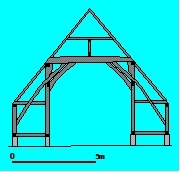 above- Reconstructed cross section of the timber framed barn built by Abbot Moot c.1400. Where Kingsbury Mill is today was the site of the Abbots Malt Mill. The Domesday Book of 1086 records three mills for St. Albans but their location is uncertain. However the Malt Mill was in existence by 1194. Work was carried out on the mill by John Whitby for Abbot Wheathampstead (1420-1440). The mill was described in 1658 as St. Michael's Mills, "formerly a Mault Mill". The St. Albans Turnpike Trust, established in 1715, had built in 1765 at a cost of £280 St. Michael's Bridge over the River Ver and this is now the oldest extant bridge in Hertfordshire. This was not the first bridge here for a bridge over the river was mentioned in a contemporary account of the Second Battle of St. Albans in 1461 and recorded as "Pons de la Maltemyll" in 1505. This is one street which certainly bore its name before the Norman Conquest. This came from the great fishpool from which in Saxon times the inhabitants of the royal estate of Kingsbury gained a livelihood. At the lower end of the street the properties on the northern side of the street ran back to Downfield and at the upper end back to the toft of Squillers. On the southern side the properties stretched down to the river at the lower end and at the upper, back to Kitchener's Mead. This was named after the Kitchener of the Abbey. In 1538 the Abbot leased to Henry Gape a tenement described as stretching from the highway in the north to the Prior's Pond on the south, towards the "Kechener's Meade". This pond will have been one of the Abbey's fishponds and was perhaps situated where there was still a pond in the early 19th century. Once part of the Crow Inn was built with a jettied upper storey around 1500. Also built around 1500 with a crown post roof of three bays. A small Late Medieval Hall house with a two storied rear wing.